The discovery of induced pluripotent stem cells (iPSCs) in 2006 was a major breakthrough for regenerative medicine. The establishment of patient-specific iPSCs has created the opportunity to model diseases in culture systems, with the potential to rapidly advance the drug discovery field. Current methods of drug discovery are inefficient, with a high proportion of drug candidates failing during clinical trials due to low efficacy and/or high toxicity. Many drugs fail toxicity testing during clinical trials, since the cells on which they have been tested do not adequately model three-dimensional tissues or their interaction with other organs in the body. There is a need to develop microphysiological systems that reliably represent both an intact tissue and also the interaction of a particular tissue with other systems throughout the body. As the port of entry for many drugs is via topical delivery, the skin is the first line of exposure, and also one of the first organs to demonstrate a reaction after systemic drug delivery. In this review, we discuss our strategy to develop a microphysiological system using iPSCs that recapitulates human skin for analyzing the interactions of drugs with the skin. Currently, drug candidates qualify for clinical trials after multiple rounds of screening using biochemical assays, cultured cells and several animal models. However, despite this rigorous assessment process, approximately 88% of drugs entering clinical trials fail, either due to low efficacy and/or high toxicity . This high failure rate is often attributed to inadequate models that do not faithfully represent human tissues or recapitulate the interaction between organs. There is an urgent need to establish surrogate systems that more closely mimic human tissues and relevant physiological conditions. The use of mice for drug testing prior to human clinical trials is a standard procedure. However, mouse and human skin have vastly different architecture, responsiveness and functionality, due to differences in thickness, hair density, and appendages . Moreover, mouse skin (with the exception of footpads) is devoid of sweat glands . The differences between mouse and human skin greatly compromise the utility of murine animals as an experimental model to study human skin. Concomitant with using animal models, new drugs are also screened using human cell cultures. A large majority of cell culture screening methods rely on the use of cells cultured under two-dimensional conditions. However, growth in two-dimensional culture conditions can impose highly unnatural constraints on cells , and as a result many fields are beginning to adopt three-dimensional (3D) cultures for drug testing, since they more reliably resemble in vivo structures, both morphologically and biochemically . Under 3D culture conditions, fibroblasts are able to support keratinocytes to differentiate into a well-structured epidermis . Indeed, 3D skin equivalents have been developed using normal human fibroblasts and keratinocytes, and are used in a broad range of applications including disease modeling and drug discovery . Driven by the need to treat burns and chronic wounds, the first human skin-like constructs were developed in the early 1980s . There have been a few adaptations to this protocol, but the general principles that govern human skin equivalent development remain largely the same as 30 years ago, with skin constructs today being predominantly comprised of fibroblasts in a collagen matrix, overlaid with epidermal keratinocytes [9, 10]. In recent years there has been significant interest in improving skin constructs, resulting in the development of pigmented , vascularized  and immuno-competent skin constructs . Recently, an innervated skin model was also developed . Nevertheless, most skin models, containing only one or two cell types and lack skin appendages, and therefore are insufficient to capture the complexity of human skin. In addition to fibroblasts and keratinocytes, the skin contains large numbers of hair follicles, immune cells, melanocytes, Merkel cell complexes, blood vessels and nerve fibers . Diseases of the skin can indicate an increased risk for separate co-morbid disorders. Two examples of this are palmoplantar keratoderma and psoriasis, both of which are associated with an increased risk for cardiovascular disease [16, 17]. Moreover, the skin interacts with other organs within the body. For example, a brain-skin neuroendocrine axis has been well described that links the nervous system and the skin . This critical axis is believed to be responsible for drug-related responses such as morphine-induced itch, where a subset of spinal neurons is activated by morphine, resulting in debilitating itching of the skin . Another dramatic and adverse drug effect observed within the skin causes toxic epidermal necrolysis , which is usually observed after treatment with anticonvulsive drugs. The factors that govern susceptibility to this secondary reaction are unknown. However, toxic epidermal necrolysis starts as a dermal inflammation that can progress to cover a large proportion of the body surface, resulting in epidermal detachment at the dermal-epidermal junction . Toxic epidermal necrolysis is often accompanied by a toxic drug reaction in the liver , indicating the presence of a skin-liver axis. Evaluation of human skin equivalents alongside other organs is important to evaluate co-morbid toxic effects of new drugs or compounds. To generate a complex skin model interacting with other human organs would require multiple cell types, which would be impossible to accomplish with somatic cells due to their limited availability, even though some cancer cell lines may have sufficient growth potential for 3D skin construction. The development of induced pluripotent stem cell (iPSC) technology enables us to obtain a large number of cells with unlimited growth potential from a limited number of somatic cells  and from noninvasive sources such as blood . In addition, our recent construction of human skin equivalents entirely from iPSC-derived fibroblasts and keratinocytes  demonstrates the feasibility of construction of iPSC-based 3D skin models. Generation and differentiation of iPSCs are time-consuming and expensive procedures, but the unlimited growth potential of iPSCs allows investigators to share cell resources for different diseases, and to screen more drug candidates for interactions . iPSCs have the capacity to differentiate into different cell types , which allows the establishment of multiorgan systems to model human physiological conditions, and perform toxicity studies . In addition, a panel of iPSCs can be created from individuals with different genetic variations to represent the diverse human population . Taken together, iPSC technology can allow us to mimic clinical trials in vitro to obtain efficacy and toxicity data that will reduce the drug attrition rate during patient-based clinical trials . The improvement in iPSC generation and differentiation protocols will further enhance the cost-effectiveness of iPSCs for drug discovery. iPSCs technology at the current time has noteworthy limitations, including retention of an epigenetic memory of their parental somatic cells , variability among iPSC lines  and genomic instability . These limitations may impair the ability of iPSCs to model human diseases for drug development. However, several solutions may be implemented to overcome such limitations, including using small molecules to reduce the effect of the residual epigenetic state . Generation of several iPSC lines from different donors can help to minimize variability , and avoiding direct targeting of p53 during reprogramming can serve to decrease iPSC genomic instability . With a better understanding of the mechanisms underlying cell reprogramming, we anticipate that iPSCs will be produced and differentiated in a more controlled fashion in the future. Construction of 3D skin equivalents is a complex procedure, involving biomaterials and different cell types. Because iPSCs vary among different lines  and iPSC-differentiated cells are heterogeneous with different differentiation stages , inclusion of iPSC-derived cells may increase variability in 3D skin constructs. Several standards will need to be achieved to ensure the reliability of a 3D skin system for drug interactions with the skin. Variations in iPSC-derived cells such as fibroblasts and keratinocytes may be minimized by establishing a set of selection criteria, such as expression of cell-specific markers, assessment of proliferation rate and lifespan, and establishment of gene expression signatures. The quality of 3D skin constructs can be guaranteed by criteria such as histological analysis, cell viability tests and barrier function assays . Moreover, intended skin disease model systems will need to reflect the corresponding disease state , such as the thickening of the epidermal layer in an in vitro psoriatic skin model . In addition to standardization of protocols for 3D skin construction and cell reprogramming, strict quality control procedures will be required so that iPSC-based 3D skin models can be reliably incorporated into the drug development process. A complex in vitro skin model has a higher potential to mimic human skin than its simple two-layer counterparts, and thus can be more useful in efficacy and toxicity studies for drug discovery. To develop a complex skin equivalent, one strategy would be to construct a basic model (containing fibroblasts and keratinocytes) and then enhance the complexity by addition of more cell types. Due to the long-standing interest in 3D skin models, a variety of human skin equivalents have been developed using a range of natural or synthetic biomaterials , exogenous scaffolding biomaterials that are dispensable for 3D skin construction . We aim to apply the most commonly used collagen scaffold, which would be beneficial for adapting the resultant skin models by different laboratories for validation. The discovery of iPSCs has made it possible for a large number of cells to be obtained from a small number of somatic cells . Moreover, use of patient-specific iPSCs allows enhanced study of a particular disease state . We will establish skin constructs using collagen as a scaffold for iPSC-derived fibroblasts and keratinocytes (Figure 1), from both normal and diseased cells. We and others have developed protocols for establishment of both keratinocytes and fibroblasts from iPSCs, and have established human skin equivalents with one [41–43] or both  of these iPSC-derived cell types. Addition of more cell types to establish complex skin models from patient-specific iPSCs for drug testing would be especially beneficial for complex diseases such as psoriasis. Schematic diagram of generating induced pluripotent stem cells to create three-dimensional skin equivalents for drug testing. Human somatic cells such as skin fibroblasts can be reprogrammed into induced pluripotent stem cells (iPSCs), from which various cell types (including fibroblasts and keratinocytes) can be differentiated. Subsequently, the iPSC-derived cells can be combined with collagen to reconstitute three-dimensional (3D) skin constructs for drug testing. One of our current research goals is to establish a skin construct in which we can mimic different modes of drug delivery (topical or systemic)  for studying drug interactions with the skin. While topical delivery can be easily replicated (since the epidermal surface of a skin construct is exposed to the air interface), mimicking systemic delivery requires the development of vascular channels within the dermal construct. We aim to establish vascular networks within the dermal portion of our skin constructs using a sacrificial hydrogel material to define open microvascular channels within the dermal scaffold. Gelatin, agarose, or alginate hydrogels can be used as sacrificial materials, which can be gelled and solubilized into a defined microvascular pattern, without affecting cell viability (for example, by heating or cooling in physiologic temperature ranges for gelatin and agarose, and by applying calcium or calcium chelators for alginate). Fibroblast-seeded collagen (which constitutes the dermal scaffold) is then cast around this sacrificial hydrogel channel network, which is then dissolved, resulting in a dermal scaffold containing an open microchannel network (Figure 2). An endothelial barrier is established by flowing in endothelial cells that attach to the open channel surfaces and form a monolayer . Medium can be flowed through the channels to feed the constructs, enabling us to avoid the drastic fluctuation of pH and nutrients in the media, which would otherwise be encountered with traditional medium change practices. This microfabrication approach allows a complex, 3D tissue made of multiple cell types to be constructed. Importantly, the endothelial cells lining the channels can also be iPSC derived, following a recently published protocol . Schematic diagram of microfluidic channels fabricated with sacrificial alginate. A sacrificial alginate construct will be fabricated using a polydimethylsiloxane mold and embedded in a collagen gel. Subsequent removal of alginate will leave behind a void that can serve as channels. Skin pigmentation is affected by many external and internal factors, such as ultraviolet, drugs, chemicals, inflammation and hormones, with keratinocytes in the skin acting to control skin pigmentation through the regulation of melanocytes and their melanin production . Adverse responses to certain drugs, including pain relievers and some psychoactive medications, can manifest with hyperpigmentation of the skin . Inclusion of melanocytes into skin constructs will therefore enable us to utilize variations in skin pigmentation as a readout for pharmaceutical screening of drugs that may cause sunlight-induced darkening of the skin. Pigmented skin equivalents have been previously established by seeding melanocytes along with keratinocytes onto a dermal skin construct . Melanocytes and keratinocytes are able to self-organize, resulting in the production of pigmented skin. However, in keeping with the theme of developing skin constructs using cells from a single individual for patient-specific drug targeting, we aim to establish human skin constructs containing iPSC-derived melanocytes, which originate from the same donor of the fibroblasts, endothelial and epithelial cells within the construct. Progress within the stem cell field is rapid, and recently a protocol was published reporting the differentiation of iPSCs into melanocytes . We will utilize this protocol to incorporate iPSC-derived melanocytes into our patient-specific skin equivalents. Such constructs can then be exposed to UVB to mimic the environmental effect of sunlight. Recently, there has been growing interest in human-on-a-chip systems, in which different human organs such as the liver, heart and lung are connected in a microphysiological system . 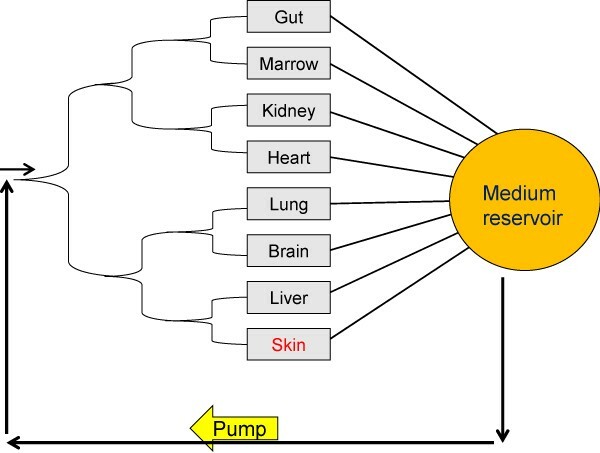 By incorporating a vascular network into our skin equivalents, the equivalents can be directly plugged into a portal that is connected to the other organs through a microfluidic system (Figure 3), similar to a configuration described previously . Questions now relate to the longevity of skin equivalents, which usually show deterioration within the dermal compartment of the equivalent approximately 2 weeks after culturing at the air-liquid interface, leaving only a small amount of time for postproduction manipulation including drug screening. This deterioration is usually due to degradation of collagen in the construct . However, the life of human skin equivalents can be prolonged up to 15 weeks, using approaches such as reinforcing the scaffolds in the dermal compartment  and/or inclusion of protease inhibitors in the culture medium . We will take measures to ensure that 3D skin constructs have sufficient lifespan for drug development studies. Additionally, the development of a universal medium that will flow through all systems and support growth of multiple organs is required. Schematic diagram of a multiorgan system. Different organs can be integrated as indicated. In this system, only a single pump will be needed to recirculate a common medium through different organs. Eight organs are shown in this system, but the configuration can be modified to accommodate different number of human organs. The skin interacts with the peripheral sensory nervous system, the autonomic nervous system, and the central nervous system in the brain-skin neuroendocrine axis . Activation of the cutaneous nervous system is also involved in various skin diseases such as psoriasis . We are working to innervate our skin model so we are able to mimic the interactions between the skin and the brain, conferring an enhanced sensitivity for pharmaceutical screening. To this end, Schwann cells and peripheral neurons can be differentiated from iPSC-derived neural crest stem cells  and then integrated into 3D skin constructs [14, 57]. Human skin equivalents have been widely used in skin disease modeling  and pharmacological studies . Different 3D skin disease models display different characteristics associated with corresponding diseases . The alleviation of disease-related symptoms, such as decreased expression of cytokeratin 16, interleukin-8 and tumor necrosis factor alpha in a psoriatic model , for example, may be an indication of drug efficacy. For hyperpigmentation-related drugs, melanin content can be quantified as described elsewhere . Previous studies with different compounds on in vitro 3D skin models have revealed several sensitive readouts, including disruption of structural integrity, loss of barrier function, reduced cell viability and elevated levels of interleukin-1α in the medium . Not surprisingly, release of interleukin-1α from keratinocytes is a primary event in the skin defense mechanism in response to damage . We aim to evaluate these parameters for toxicity assays. Establishment of reliable drug screening protocols using skin equivalents will generate valuable efficacy and toxicity data to aid in drug discovery and screening. Skin is a highly complex organ containing hair follicles, sweat glands, and nervous, lymphatic and vascular systems, among many other cell types within the dermis and epidermis. Current skin models are very basic, and only replicate the two main compartments of human skin, keratinocytes and fibroblasts. Our research plan is to gradually incorporate different cell types into our human skin equivalents, in order to better replicate a functional human skin. While we are starting by introducing pigmentation and blood vessels, our long-term goals are to establish a highly complex skin construct that includes hair follicles, nerves, and immune cells to reliably mimic human skin. We will aim to generate hair follicles in skin constructs using iPSC-derived papilla cells. Dermal papilla cells are specialized fibroblasts located at the base of the hair follicle and are crucial for hair follicle development. Cultured dermal papilla cells have previously been used to instruct hair growth in recipient tissues using both rodent and human cells [63, 64]. However, to date, dermal papilla cells have not been successfully differentiated from iPSCs. Development of a robust procedure to differentiate iPSC-derived papilla cells from iPSCs will provide us with an unprecedented opportunity to utilize iPSCs for regenerative medicine. To generate skin constructs containing immune components, precursors of dendritic cells can be incorporated into constructs, to then be differentiated into Langerhans cells in the epidermis and into dendritic cells in the dermis . T cells can be derived from iPSCs with a published protocol , and procedures to co-culture T cells with keratinocytes  or fibroblasts  can be adapted to integrate iPSC-derived T cells into a complex 3D skin system. In closing, incorporation of different iPSC-derived cell types into vascularized human skin equivalents will enable us to replicate complex skin disorders in vitro. Launching human-on-a-chip systems will enable us to better mimic human physiological conditions and to more efficiently assess the efficacy and toxicity of drug candidates to treat human disease. The authors are grateful for technical support from Ming Zhang. This work was supported by a Skin Disease Research Center grant from the NIH/NIAMS (P30AR044535), a Mandl Connective Tissue Research fellowship, a Helmsley Foundation grant starter from the Columbia Stem Cell Initiative, NYSTAR and NYSTEM, and lastly by the NIH/NCATS Microphysiological Systems Program (U18TR000561). The funding for the publication costs associated with this article comes from NIH grant 5U18TR000561-02.